Dive Rite unveiled their latest diving light - the CX1 - at EUROTEK.2018. Dive Rite states that the CX1 will produce a bright beam for a long period of time, before the light level begins to taper off. To achieve this performance they used a high capacity rechargable 5200 mAh 26650 li-ion battery, with a Cree XM-L2 U4 emitter and orange peel reflector. The result is a torch that produces 1,000 lumens at the touch of a button, with a useful 3.5 hour burn time on the high power setting. "We thought it important that this light had four power settings, including a strobe function, and the diver had a choice in how they dive with the torch" stated Jared Hires, Dive Rite's Marketing Director. "We have therefore designed the CX1 so that the diver can hold it in their hand, they can dive it with our 'soft handmount' on the back of the hand, or they can attach it to a helmet using our 'quick release mount' or QRM system. We also incorporated a flange on the base of the torch so that the diver can tie a bolt snap to it, and then clip it onto a D ring when it is not in use." Dive Rite are aware that some divers use a 18650 battery. The Florida based manufacturer has thoughtfully included a sleeve that can be wrapped around the battery, so that the diver can use it in the CX1. 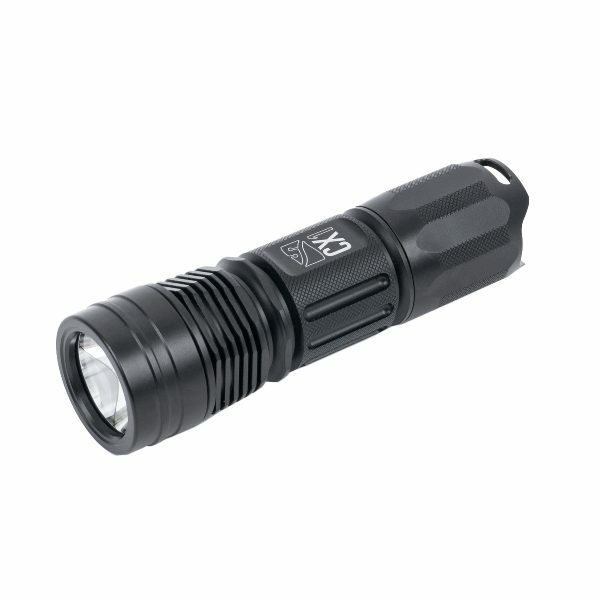 The CX1 is a lightweight torch thanks in part to its anodized Aluminum body. It comes complete with a battery, charger, lanyard, battery sleeve and a protective case.